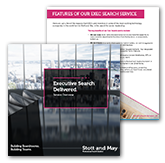 Download our Executive Search Guide. Learn why CEO’s and investors in some of the most exciting technology companies in the world are partnering with Stott and May in search for Senior Leadership. This guide takes you through the features and benefits of our Executive Search service and will arm you with some key questions to contemplate prior to selecting your chosen agency.